American Concrete Institute. (2002). "Building code requirements for reinforced concrete and commentary," ACI 318-02, Detroit, MI. Aitken, G. H., Elms, D. G., and Berrill, J. B. (1982). "Seismic response of retaining walls," Research Report 82-5, Department of Civil Engineering, University of Canterbury, Christchurch, New Zealand, 87 pp. Clough, G. W., and Duncan, J. M. (1991). "Earth pressures." Foundation engineering handbook. 2nd ed., H.Y. Fang, ed., Van Nostrand Reinhold, New York, Chapter 6, 223-235. Davies, T. G., Richards, R., and Chen, K. -H. (1986). 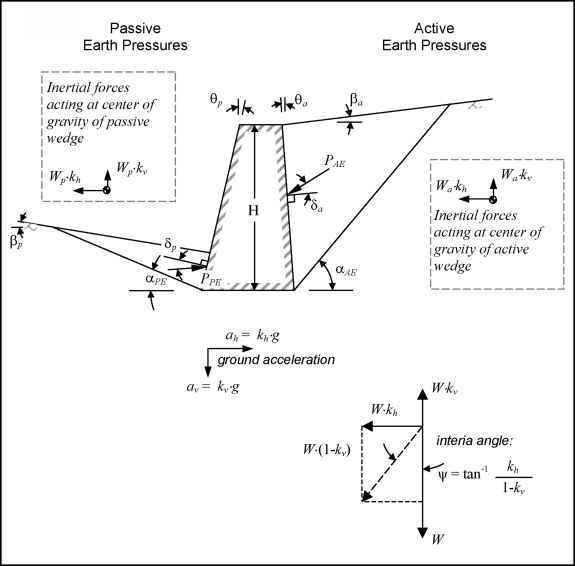 "Passive pressure during seismic loading," Journal of Geotechnical Engineering, 112(4), 479-483. Duncan, J. M., and Seed, R. B. (1986). "Compaction-induced earth pressures under Ko-conditions," Journal of Geotechnical Engineering, 112(1), 1-22. Ebeling, R. M. (1992). "Introduction to the computation of response spectrum for earthquake loading," Technical Report ITL-92-4, U.S. Army Engineer Waterways Experiment Station, Vicksburg, MS.
Ebeling, R. M., and Morrison, E. E. (1992). "The seismic design of waterfront retaining structures," U.S. Army Technical Report ITL-92-11, U.S. Navy Technical Report NCEL TR-939, U.S. Army Engineer Waterways Experiment Station, Vicksburg, MS.
Ebeling, R. M., and White, B. C. "CorpsWaUROTATE-"Dry": A computer program to perform a rotating or sliding analysis of a retaining wall for a specified earthquake acceleration time history" (in preparation), U.S. Army Engineer Research and Development Center, Vicksburg, MS.
Ebeling, R. M., Green, R. A., and French, S. E. (1997). "Accuracy of response of single-degree-of-freedom systems to ground motion," Technical Report ITL-97-7, U.S. Army Engineer Waterways Experiment Station, Vicksburg, MS.
Frankel, A., Harmsen, S., Mueller, C., Barnhard, T., Leyendecker, E.V., Perkins, D., Hanson, S., Dickman, N., and Hopper, M. (1997). "USGS National Seismic Hazard Maps: Uniform hazard spectra, de-aggregation, and uncertainty." Proceedings of FHWA/NCEER Workshop on the National Representation of Seismic Ground Motion for New and Existing Highway Facilities. I. M. Friedland, M. S. Power, and R. L. Mayes, ed., NCEER Technical Report 97-0010, National Center for Earthquake Engineering Research, Buffalo, NY, 39-73. Gomez, J. E., Filz, G. M., and Ebeling, R. M. (2000a). "Development of an improved numerical model for concrete-to-soil interfaces in soil-structure interaction analyses; Report 2, Final study," ERDC/ITL TR-99-1, U.S. Army Engineer Research and Development Center, Vicksburg, MS.
_. (2000b). "Extended load/unload/reload hyperbolic model for interfaces: Parameter values and model performance for the contact between concrete and coarse sand," ERDC/ITL TR-00-7, U.S. Army Engineer Research and Development Center, Vicksburg, MS.
Headquarters, U.S. Army Corps of Engineers. (1989). "Retaining and flood walls," EM 1110-2-2502, Washington, DC. _. (1992). "Strength design for reinforced-concrete hydraulic structures," EM 1110-2-2104, Washington, DC. _. (1995). "Earthquake design and evaluation of civil works projects," ER 1110-2-1806, Washington, DC. _. (1999). "Response spectra and seismic analysis for concrete hydraulic structures," EM 1110-2-6050, Washington, DC. _. (2000). "Time-history dynamic analysis of concrete hydraulic structures," EC 1110-2-6051, Washington, DC. Idriss, I. M., and Sun, J. I. (1992). "User's manual for SHAKE91: A computer program for conducting equivalent linear seismic response analyses of horizontally layered soil deposits," Center for Geotechnical Modeling, Department of Civil and Environmental Engineering, University of California, Davis, CA. Itasca Consulting Group, Inc. (2000). FLAC (Fast Lagrangian Analysis of Continua) user's manuals, Minneapolis, MN. Jaky, J. (1944). "The coefficient of earth pressure at rest." Magyar Menok es Epitesz Kozloi (Journal of the Society of Hungarian Architects and Engineers). Kuhlemeyer, R. L., and Lysmer, J. (1973). "Finite element method accuracy for wave propagation problems," Journal of the Soil Mechanics and Foundations Division 99(SM5), 421-427.
computer program for approximate 3-D analysis of soil-structure interaction problems," EERC Report No. EERC-75-30, Earthquake Engineering Research Center, University of California, Berkeley, CA. MacGregor, J. G. (1992). Reinforced concrete mechanics and design. Prentice-Hall, Englewood Cliffs, NJ, 848 pp. Mononobe, N., and Matsuo, H. (1929). "On the determination of earth pressures during earthquakes." Proceedings, World Engineering Congress 9, 177-185. Okabe, S. (1926). "General theory of earth pressures," Journal Japan Society of Civil Engineering 12(1). Pace, M. E. (1994). "User's guide to CTWALL-A microcomputer program for the analysis of retaining and flood walls," Instruction Report ITL-94-7, U.S. Army Engineer Waterways Experiment Station, Vicksburg, MS.
Paulay, T., and Priestley, M. J. N. (1992). Seismic design of reinforced concrete and masonry buildings. John Wiley and Sons, Inc., New York, 744 pp. Richards, R., and Elms, D. G. (1979). "Seismic behavior of gravity retaining walls," Journal of the Geotechnical Engineering Division 105(GT4), 449464. Seed, H. B., and Whitman, R.V. (1970). "Design of earth retaining structures for dynamic loads, in lateral stresses in the ground and design of earth-retaining structures." ASCE Specialty Conference. 103-147. Terzaghi, K. (1943). Theoretical soil mechanics. John Wiley and Sons, Inc., New York, 510 pp. Whitman, R.V. (1990). "Seismic design and behavior of gravity retaining walls, design and performance of earth retaining structures," ASCE Geotechnical Special Publication No. 25, 817-842. Whitman, R.V., and Liao, S. (1985). "Seismic design of gravity retaining walls," Miscellaneous Paper GL-85-1, U.S. Army Engineer Waterways Experiment Station, Vicksburg, MS.
Wood, J. H. (1973). "Earthquake-induced soil pressures on structures," Report No. EERL 73-05, California Institute of Technology, Pasadena, CA. Zarrabi-Kashani, K. (1979). "Sliding of gravity retaining wall during earthquakes considering vertical acceleration and changing inclination of failure surface," S. M. Thesis, Department of Civil Engineering, Massachusetts Institute of Technology, Cambridge, MA.